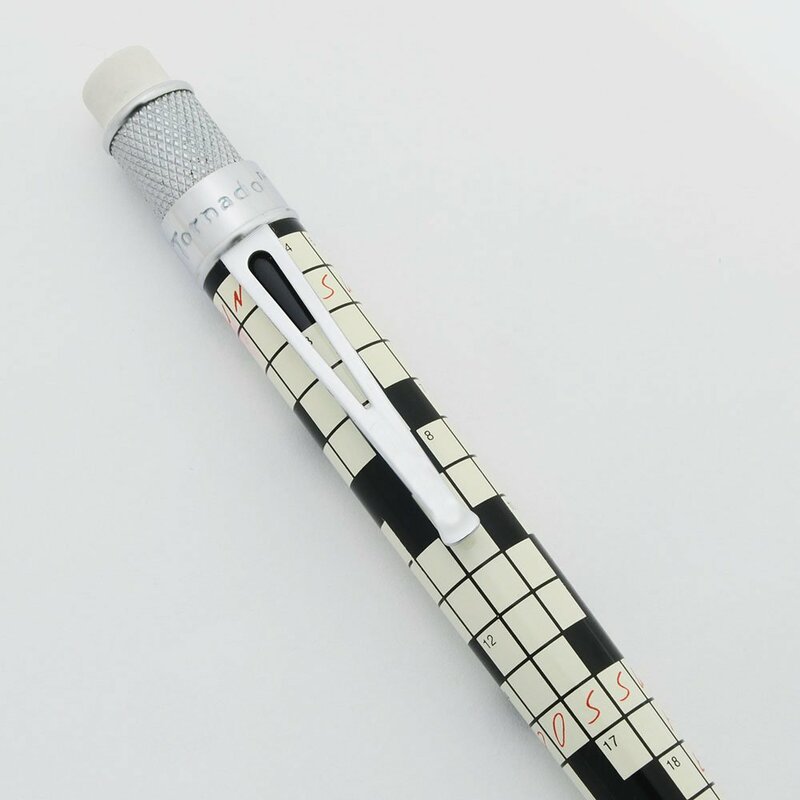 Retro 51 Tornado mechanical pencil. This is 1.15mm Crossword version with a crossword puzzle printed on the barrel. 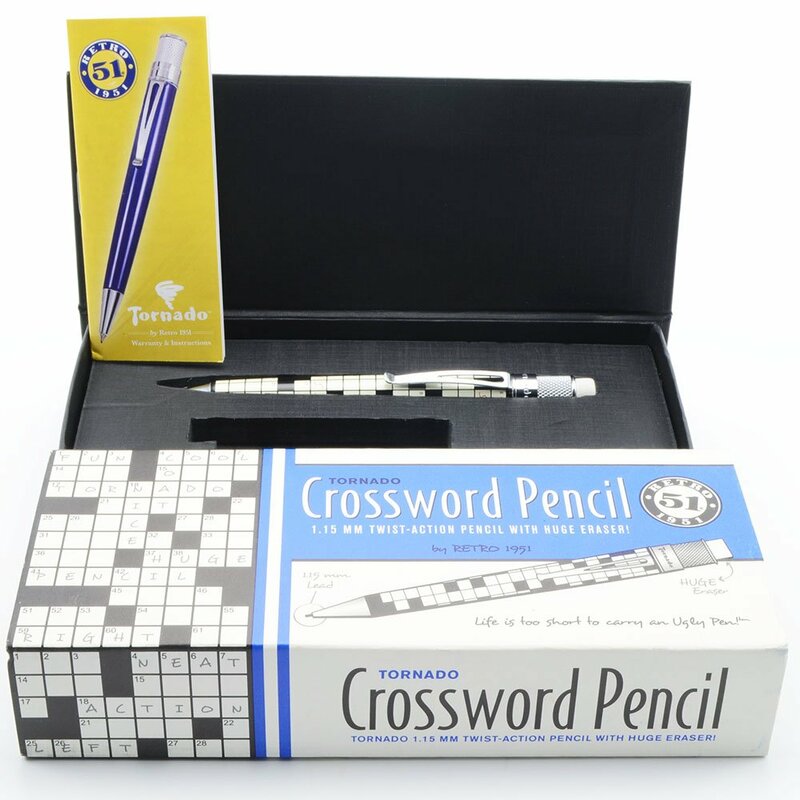 The pen in in excellent + condition and ships in the older Tornado Crossword Pencil packaging. Manufacturer and Year Retro 51, the company is in the USA and the components are manufactured in Taiwan -- Circa 2010-2018, current production and we found mention of the model as early as 2010. This pencil uses older packaging. Filling System Takes 1.15mm leads that extend and retract via a twist mechanism. The label on the box says that this is the 0.9mm version that used to be produced but the pen definitely takes 1.15mm leads. Color The pencil has a crossword pattern on it with a few words filled in with red "ink." The trim is metal colored and it has a large eraser. Condition Excellent + condition. The eraser is unused and the pen has no handwear. There is one area to the left of the clip that has a round mark and a red smudge. We think the red smudge is a manufacturing defect from before the finishing coat was applied. There is some very slight plating wear and discoloration in the trim. It ships in its original packaging.